Card Text Deal 1 to each creature after it enters play. Does Autocannon’s ability affect only enemy creatures? No. Autocannon’s ability affects every creature, including your own. Does Autocannon’s ability trigger before or after “Play:” abilities on creatures that enter play? The active player decides. 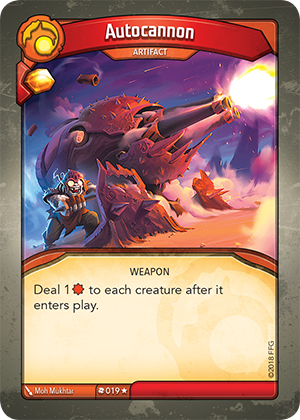 “Play:” abilities resolve “after the card enters play” which is the same time as Autocannon’s ability, so the active player resolves the timing conflict. If a creature with 1 power enters play, does it trigger its “Play:” ability before Autocannon’s ability destroys it? Since Autocannon’s ability and “Play:” abilities occur at the same time, the active player decides in which order they resolve. Thus, if the active player chooses to resolve the “Play:” ability on the creature before resolving the damage, the “Play:” ability fully resolves before the creature is destroyed.